Start by signing up with Blarlo. Blarlo is a nice option for good professional translators to receive work from all corners of the world. Access your profile and complete the rest of your information: languages mastered, mother tongue, fields of expertise, your CV, etc. We will review everything to complete your registration. 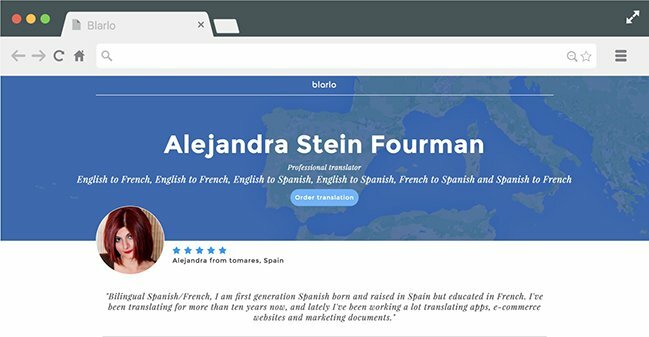 Once we have reviewed and activated your profile, you can start translating with Blarlo. We look forward to having you in our team! If you become a translator for Blarlo, we will create a public profile for you to improve your online visibility. The languages you have mastered so far, your mother tongue, your main specializations and translation portfolio will show up on your profile so any company in the world may contact and hire you for translation services. You’ll have your translator’s page optimized for search engines and you will be able to share your profile wherever you like. For free. Our fees range from 0.080€/ word (we’ll always pay you in EUR) for online commissions and negotiated for the projects we manage internally. (Chinese, Japanese or Korean) for online commissions. You can send us your invoice with outstanding commissions at any time to hola@blarlo.com. The invoices we receive each month shall be paid after 30 days on the fifth of each month. HOW ARE TRANSLATION TASKS ASSIGNED? Whenever there are new tasks in Blarlo suitable for your language skills (language, quality level, specialization areas, etc), we will send you and other similar translators an e-mail notification. WHAT TOOLS CAN I USE FOR THE TRANSLATION? At Blarlo we let you use our platform to do translation work, but you may also use whatever translation tools you are most familiar with. So you can work exclusively in our platform or make use of other translation tools you may be accustomed to. DO I HAVE ANY OBLIGATION? As a Blarlo translator, you may choose the translation tasks you wish to do and when you want to work on them. You are free to work from wherever you feel comfortable, whenever you wish.